Learn How to Get New Leads and Watch Your Business Explode! You’ve probably asked yourself if you should be buying internet leads or spending money on SEO and Google Adwords. Each of these requires significant time and resources, not to mention a massive risk if you do not have the expertise. What if we told you there is a simpler way to get more leads? 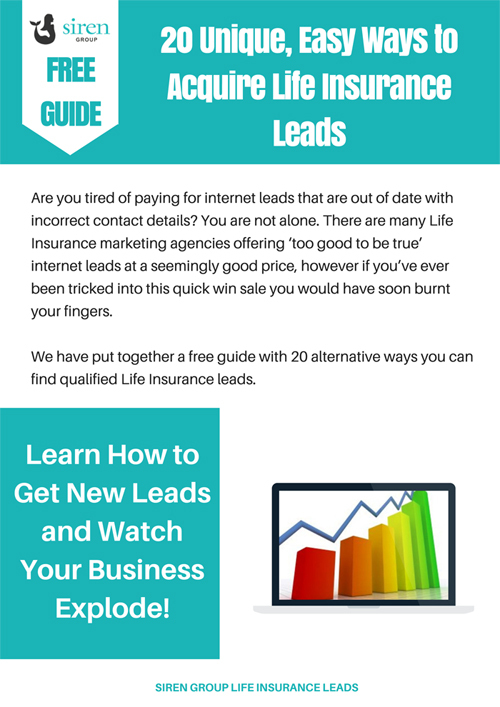 We have put together a free guide for you with 20 ways on acquiring life insurance leads. Website owners – having a website and getting visitors is just the first step in the right direction, but harnessing this traffic is the ultimate goal with a few clever and simple tricks. And if you don’t have a website, we’ll show you low-cost alternatives. Online Gaming Apps – if you’ve heard of Pokemon GO you will know how big gaming just is surpassing some of the biggest social media channels such as Twitter with over 21 Million daily active users. In this guide we give you great ideas on how to capitalize on this and get more sales from this phenomenal app. Proactively networking – merely attending an event is not enough these days, we guide you through unique ways on how to get more leads from networking opportunities. Social Media – best practice tips to directly acquire new leads across multiple social media channels. Simple, effective steps that any Broker can do. These are the opening fundamentals of this lead generation guide, but we build on each of these with a lot of other specific strategies. We’ve taken the industry-leading tips and condensed them into this free guide for you. Enter your email address in the form, and we’ll send you 20 unique, easy ways to acquire life insurance leads today! Download 20 unique, easy ways to acquire life insurance leads by entering your email address and clicking the button below to start growing your business like the industry's top brokers!